A selection of Fort Taco's famous "puffy tacos." When Fort Taco (8106 Manchester Road, Brentwood; 314-647-2391) opened in the former Rally's in Brentwood last November, owners Matthew Martinez and his silent partner intended it to be the first of many locations. This December, they are taking a step toward that goal when they open a second outpost of the drive-through Mexican restaurant in Florissant. As first reported by 40 South News and Feast Magazine, the second Fort Taco will be located on N. Lindbergh Boulevard in a former Dunkin Donuts restaurant. Martinez and his partner chose the location based on two important criteria: that it was drive-through ready and was located on a street that saw a minimum of 30,000 vehicles pass per day — two factors, they explain, that were surprisingly difficult to find. The pair had planned to open a second location earlier, but admit to some growing pains. "Basically, we messed everything up at first. We never had a restaurant, and we couldn't open early for training because of [Brentwood] permits," Martinez's partner explains. Additionally, the pair noticed that it took some time for customers to understand the concept. "We saw people pulling up to the menu and turning around because of sticker shock," he continues. "I think people thought we were like Taco Bell. This isn't the kind of place where you need to order five tacos." Now that they have been open for a year, Martinez and company feel comfortable enough with their processes and the team they have assembled to push forward with expansion. Their new Florissant location will have the same tiny menu as the one in Brentwood and will maintain the restaurant's stringent standards — from-scratch cooking and made-to-order tacos. One notable change, however, is that the Florissant spot will have a small seating area. A third location for Fort Taco is currently in the works, though no deal has been closed. The plan was originally for a spot in St. Charles, but Chesterfield is also under consideration. Martinez says that they are taking the expansion one step at a time — whether Fort Taco will be a local, regional or national chain is still up in the air. "Basically, we just want to allow everybody to experience our grandma's tacos," he says. 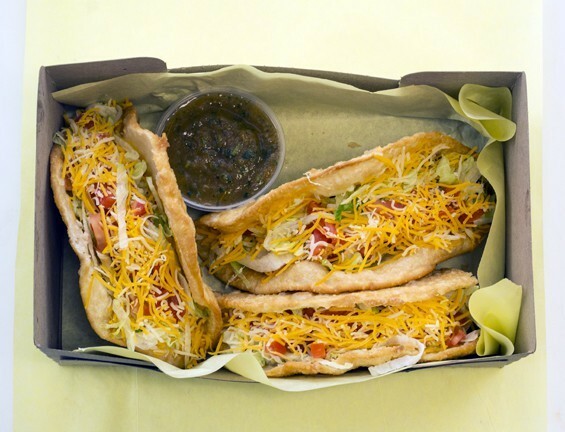 "Wherever someone wants a puffy taco, we will entertain that. If it's across the nation, great. If it's just St. Louis, that's fine too. As long as we can maintain our product and customer service, we will do it."